It's almost summer and time to get those toes out. Love to paint them but worried about all the toxins your body can absorb through the polish and the remover? Your worries are over with our exciting line of Hopscotch Kids Water Colors safe nail care products - they're brand new to Canada. Straight from the Oscar swag bags to Lavish & Lime, our Hopscotch Kids natural nail polish is safe and free of harmful chemical solvents found in most polishes, ie. Toluene, Formaldehyde and Phthalates. It's completely water-based, free of noxious fumes, biodegradable and doesn't result in yellowing or drying of the nails. 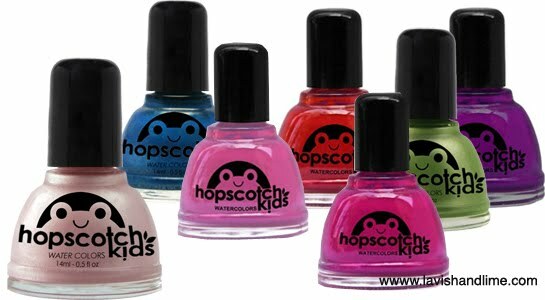 Hopscotch Kids nail polish is made in the US. With names like Hands Up, Seven Up and Bubble Gum, Bubble Gum in a Dish, you can tell the great range of colours are geared towards the younger set, but to be honest, we think this polish is ideal for adults too. We particularly love the lighter pale pink Teddy Bear, Teddy Bear and the Barbie-esque pink Ice Cream, Soda Pop. In fact, the owner of Hopscotch Kids tells us she paints her three girls' and her own nails - with just one easy coat - before running off to church on Sundays. In addition to single bottles, we have a Hopscotch Kids nail polish twin pack - in two different colour ways available (comes with a free buffer), plus a party pack that includes two bottles plus remover and a buffer. Both packs make ideal birthday gifts for any glam girl. The Hopscotch Kids polish remover is all natural and corn-based. It includes Aloe and Vitamin E for extra moisturizing. The remover comes with a free buffer for a complete nail care pack. Go glam naturally - and safely - this summer. Hopscotch Kids Water Colors Safe Natural Nail Polish is available in Canada at Lavish & Lime. If you have any thoughts or ideas about nail polish or natural beauty products in general, please leave a comment below. We'd love to hear from you!